What can I say? Classic, with a bazillion interpretations. No sausage? Use ham and chicken. Not low carb? Make dirty rice. Vegan? Use a combo of black and red beans. It’s all good. Add oil to a very large nonstick saucepan or risotto pan. Over medium heat, sauté onion, garlic, bell pepper and celery until onion is translucent. Add parsley, Aidell’s sausage, bay leaf, cayenne pepper, chipotle powder, smoked paprika, and smoked cinnamon. Cook, stirring often, 5 to 6 minutes. Add tomatoes (with juice), and bone broth. Gently simmer, uncovered, stirring occasionally, about 5 minutes. Stir in shrimp. 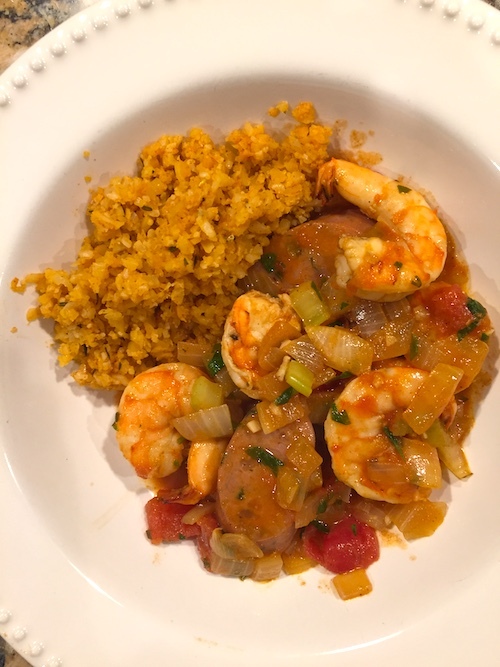 While shrimp are cooking, make Cajun Cauliflower-Rice. Cook the shrimp until they turn from translucent to opaque, and curl. Remove bay leaf. Season to taste with more cayenne pepper and/or salt. This entry was posted in Low Carb, Soups, Stews, Stocks on January 28, 2019 by Blackberry Season.